Minneapolis 311 Poster – Replaced by Who to Call Poster! The old Minneapolis 311 Poster has been replaced, effective immediately, by the new, Who to Call for Housing Help Poster. Different cities in Minnesota have different Landlord-Tenant Laws. One requirement in Minneapolis (besides obtaining a Minneapolis Rental License), is to display the “Who to Call for Housing Help” poster. 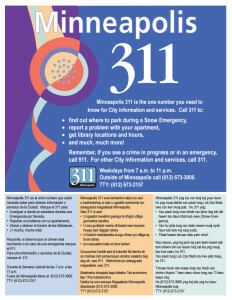 Previously called the Minneapolis 311 Poster, as of February 18th, 2016, Minneapolis Landlords and Tenants should now reference the new “Who to Call” poster. The Who to Call for Housing Help Poster should be in color, in a prominent area, and framed. Find all the specifics in the bulletin from the City of Minneapolis below. 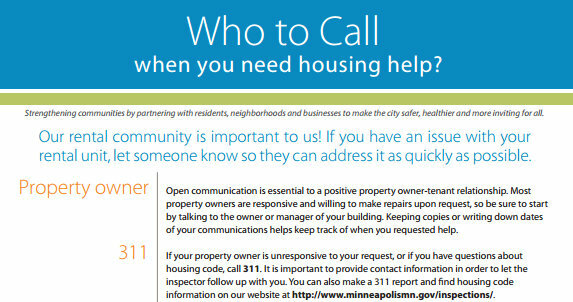 These resources listed on the Who to Call Poster should result in better, more appropriate options for Renters and better communication between Landlords and Tenants in Minneapolis. If you’re ready to purchase an investment property, or stop renting and buy a house, please contact us – we’re happy to help! We have a variety of options to fit unique scenarios. Last year, the Department of Regulatory Services began to address gaps in our community engagement framework. One theme that emerged as we discussed these gaps was the need for improved communication between Housing Inspections, rental property owners, and tenants. Minneapolis City Ordinance 244.2000 requires that every rental license holder post the rental license certificate and any other required informational posting as approved by the director of Regulatory Services in a conspicuous location. Currently, that required informational posting is a 311 poster. Landlords have told us that they do not like the Minneapolis 311 poster because it points people directly to reporting issues to Housing Inspections, with no reference to reporting issues to the landlord first. Tenants and tenant advocates tell us that the poster is inadequate because it doesn’t list alternative resources that, depending on the situation, may be more appropriate than 311. To that end, we developed the Who to Call poster, incorporating feedback from rental property owners, tenants, and community groups. You will notice that the rental property owner is the first resource listed on the poster, followed by City resources, then other organizations that may be able to assist tenants. The rental license certificate and Who to Call poster must be conspicuously posted in a frame or frames with transparent cover in the common area immediately adjoining the front or principal entrance of the building. If there is no common area in the front of your building, the license and Who to Call poster should be posted at or near the entrance of each dwelling unit. If your rental unit is a condo unit in a building with 5 or more units, you do not need to post the license and Who to Call for Housing Help poster, but you must provide a copy of each to your tenants. The old Minneapolis 311 posters should be discarded and replaced with a color copy of the Who to Call for Housing Help poster. Download the poster from the Regulatory Services website to your personal color printer. Pick up a copy at Minneapolis Development Review, 250 S 4th St, Room 300. Request a poster from a City of Minneapolis housing inspector during an inspection. To obtain a copy in Spanish, Somali, or Hmong, call the Regulatory Services Accessibility Line at 612-673-3221, or email [email protected]. In addition, Regulatory Services is happy to mail a copy (or copies) directly to any property owner who would prefer to receive a copy by mail. To receive a copy by mail, please email or call Caitlin Maxwell-Glenn at [email protected] or (612) 673-3683. We hope that this Who to Call poster will help to foster communication and trust between renters, landlords, and Housing Inspections, and we appreciate your help in this effort. 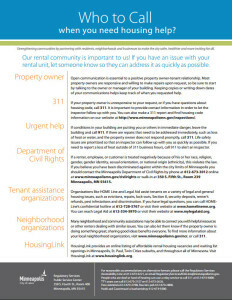 Posted in Evictions Notice MN, Free Legal Advice MN, Homeline, Landlord, Landlord Tenant Law MN, Minneapolis, Minneapolis 311, Minnesota Renters Rights, Tenant and tagged 311 Minneapolis, City of Minneapolis, City of Minneapolis Rental License, Home Line, Homeline MN, minneapolis 311, minneapolis 311 poster, Minneapolis Rental License, Minnesota Landlord Tenant Law, Minnesota Rental Laws, Minnesota Tenants Rights, MN Housing Link, MN Rental Laws, MN Renters Rights, Renters Rights, Renters Rights MN, Tenant Rights MN, Tenants Rights MN.